Urdam Tours & Travels - having established itself over the past several years in the leisure and holiday markets, continues in the tradition to provide travel - related products and services to discerning travelers, now also to the Holy Cities. Our all packages include Visa Formalities, Airport meet and assist Services, Airport to Haram Transfers and Booking and Reservation in Hotels- Apartments of Choice “Subject to vailability”. What you have to do is just to Contact us or to use the Online Contact Form and one of our Umrah department’s consultant will get back to you within 24 hours with all possible solutions and suggestions. Men should utter this aloud while women should say it silently. Repeat this Talbiyyah frequently, and engage in the praise of Allah, in supplications fro forgiveness and it the enjoining of what is good and forbidding of what is evil. "Rabbana, atina fid - dunya hasanatan wa fi-akhirati hasanatan wa qina adhaban-nar"
After completing the seventh circuit, pray two Rak'ats behind the Station of Ibraheem (Maqam-e-Ibraheem) if it is possible, even though you may be a little far from it, Otherwise at any other place within the sacred Mosque. "La illaha illal-Lah, wahdanhu La sharika Lah . Lahul-mulk wa lahul-hamd, wa huwa'ala kulli shayin qadeer. La ilah illal-lah, wahdawo, Anjaza wadahu wanasara abdahu wa hazamam al ahzab wahahu"
"There is no deity except Allah, the One without partner. His is the dominion and his is the praise, and He is powerful over everything. There is no deity except Allah, completed His promise, supported His Slave and defeated the parties Alone"
It is preferable to utter this supplication three times but there is no harm in saying it less then three times. You then descend from as-Safa and does the Sa'ye of the 'Umrah' seven times, increase you pace between the green posts, but walk at a normal pace before and after them. When you climb on the Mrawah, praise Allah and so as you did at as Safa, repeating your supplications. If you can conveniently do so, three times. There are no required formulas or supplications for Tawaf and Sa'ye. It is up to the worshipper to praise Allah or supplicate Him in his own words, or he may recite portions of the Qur'an, with due regard to the supplications which the Prophet (Peace be upon him) recited during the performance of those rites. After Sa'ye your 'Umrah' ends by shaving or shortening hair. After this, the prohibitions pertaining to the sate of Ihram are lifted and you may now resume you normal life.If you are doing Hajj Al-Tamatt'u the sacrifice of a sheep or the seventh part of camel or a cow becomes obligatory for you on the Day of Sacrifice (10th of Dhul-Hijjah). If you cannot afford this sacrifice, it is obligatory for you to fast ten days, three of them during the hajj and seven after returning home. In case, you are performing hajj Al-Tamatt'u or hajj Al-Qiran, it is preferable to fast these three days before the Day of 'Arafat" (9th of Dhul-Hijjah). 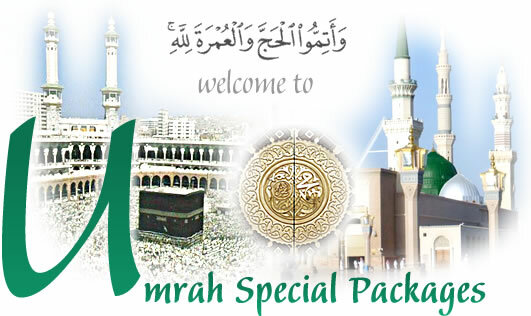 To get up-to-date information and prices of Umrah packages, please Contact us or use the Online Contact Form.